In May 2014, my mom made a doctor’s appointment for me. I was 18 and theoretically capable of making it myself, but on this particular occasion, the decision to see a medical professional had been hers not mine. We were seated side by side in the waiting room at my childhood general practitioner’s office, flipping through a People magazine. When the doctor called my name, my mother stood up and offered him a furtive explanation for our visit. I rolled my eyes as the hushed tone of her voice drifted back to me over the hum of the air conditioner. “I’m just worried that she’s not eating enough,” she said. Sitting on the examination table a few minutes later, my doctor looked me up and down. “You must have really cut those carbs in order to drop that much so fast,” he probed, studying my records. “I’m having more of them recently,” I offered. He considered me for another moment before closing my folder and standing back up. “Well, sounds like you’re eating well. And I gotta say, I think you’re looking good.” He left the room to inform my mother that I was in perfect health. As we made our way back to the car, my mother was partially confused, partially crestfallen. It surprised me that I felt the same. I had resisted the appointment because I had expected more than two minutes of examination; I had expected to be put in the hot seat about my diet and exercise. Being the horrible liar that I am, I had expected it to surface, at some point, that my daily caloric intake had shrunk to well below 1,000 — and that was before factoring in workouts. I had expected to be told I needed to stop. Instead, I got a green light to keep starving myself. By the time I was in my last year of high school, I was pretty sure I knew what eating disorders looked like: skeletal. Emaciated. Girls whose elbows are the widest part of their arms. It’s an image that has been popularized by many media outlets that have covered disordered eating — see, for example, Netflix’s recent controversial film To The Bone. You’ve likely heard plenty about anorexia nervosa (AN) and bulimia nervosa (BN). You may believe these illnesses to be relatively rare, and statistically, you wouldn’t be wrong: prevalence rates vary from source to source, but estimates tend to fall somewhere around 0.5 per cent of the population for AN and around one to three per cent for BN, according to Dr. Stephanie Cassin, Associate Professor and the Director of Clinical Treatment at Ryerson University. “The reality is that probably the far majority of forms of disordered eating fall outside of those diagnostic criteria,” added Cassin. The Diagnostic and Statistical Manual of Mental Disorders (DSM) actually includes a label for such cases: Other Specified Feeding or Eating Disorder (OSFED). This type of diagnosis is known as a “residual category,” which is essentially a catch-all for those who don’t meet criteria for “fully-blown” disorders such as AN or BN, which are known as threshold eating disorders (TED). The classification of mental disorders is complicated, and no section of the DSM is without criticism. But, this method of classifying eating-related pathology paints a false picture of the ‘average’ eating disorder. As much as OSFED’s name suggests it to be anomalous, multiple studies of DSM-5 eating disorders have found it to be a very common diagnosis. Researchers have also found that OSFEDs are equal to TEDs when it comes to psychological impairment. 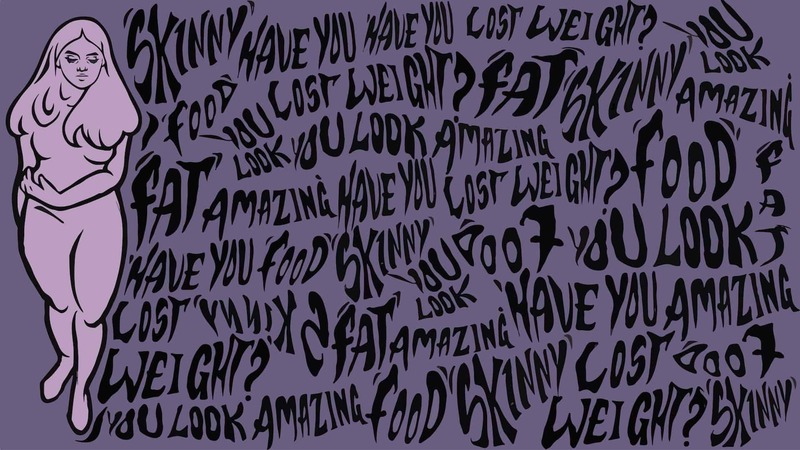 In spite of all this, there is a common perception that your eating disorder can’t be ‘serious’ unless you’re thin. It also bears mentioning that EDs are also widely believed to only affect young white women, which is most definitely not true. Disordered eating affects all races, ethnic groups, and genders, with transgender individuals reporting slightly higher rates. False perceptions make it all too easy for dangerous behaviours to go unnoticed, even by doctors. When my own doctor failed to catch my disordered eating, I was in deep enough that alarm bells should have been sounding. Between March and September of that year, I lost nearly 25 pounds. But I still didn’t ‘look like’ I had an eating disorder. And were it not for my mother and my best friend, nobody around me would have expressed any concern. Quite the opposite, actually. Not looking ‘sick enough’ can often be a barrier for people trying to access help for disordered eating. In actuality, the things that make living with an eating disorder utterly miserable — an unrelenting fear of weight gain, constant shame and self-disgust, intense preoccupation with food, and the like — exist independent from the physical reality of one’s body. When we talk about eating disorders, we often forget that they are chiefly psychological disorders, only zeroing in on what is outwardly visible. Maddie, a fourth-year student who wished to be identified only by her first name, has experienced first hand how the line between wellness and pathology can blur. She said she had a complicated relationship with food growing up and that starting in high school, she fell into numerous ED behaviours in an effort to lose weight. At the same time, she was suffering from severe depression and anxiety. Through getting help for her depression and anxiety, she began to start eating again, and her weight stabilized. “I felt like I was okay, because I was eating whatever I wanted,” she told me. “I thought that I was kind of okay, because… I wasn’t throwing up. I wasn’t not eating… But I hated myself,” she added. In a society that tends to conflate thinness with not only health but success and morality, feelings like Maddie’s are becoming increasingly normalized. According to a population-based study of approximately 5,000 teens conducted by project EAT, more than half of teen girls and a third of teen boys engage in unhealthy weight control behaviours. Now, with movements like #fitspo creeping into our social media feeds, it is harder than ever to not obsess over food and exercise. Unsurprisingly, our obsession with thinness plays a key role in the development of eating disorders. Eric Stice, a Senior Research Scientist at Oregon Research Institute, has published multiple papers on EDs. He says that although there are numerous factors that may contribute to the development of EDs — biological, psychological, and sociological — internalization of a thin ideal is a critical lynchpin. “Everything we know about risk factors for eating disorders really points in the direction of pursuit of the thin ideal… basically driving the predictive effects of other risk factors,” he said. In other words, a variety of factors contribute to EDs, but it all exists alongside the belief that being thin is always better. It’s hard not to put such significance onto weight when we talk about it constantly. There is no higher compliment, evidently, than taking notice of someone’s weight loss. Meanwhile, despite a growing movement for body positivity, fat-shaming remains a beloved national pastime. It’s also totally commonplace, especially for women, to engage in lengthy sessions of mutual disparagement about their own bodies. A 2011 paper aptly titled “’If You’re Fat, Then I’m Humongous!’” found that exchanges like these both reflect and contribute to body dissatisfaction. Increasingly, there are signs that changes may be on the way: for instance, France has required models to be certified as healthy by a medical professional, and lingerie brand Aerie has chosen to go retouch-free with its ad campaigns. But the path to widespread body positivity is uphill — perfect body ideals are too deeply ingrained to be dislodged by PR-friendly marketing strategies. It’s time for all of us to start challenging them in our day-to-day lives. This is what The Body Project, a collaborative eating disorder intervention program co-founded by Eric Stice, intends to do. The program has been delivered to millions of girls and young women in 25 countries, and it has been immensely successful. The intervention is so powerful that its effects can be seen in neuroimaging scans: after going through the program, the brain’s reward regions light up less in response to supermodels and more in response to people of average weights. The intervention is a deceptively simple procedure. Stice describes it as allowing young women “to talk themselves out of pursuing the thin ideal,” as opposed to having a professional attempt to do so. “What we do in the Body Project is, we give young women… an opportunity to collectively define the appearance ideal that is personified in our mass media, and then discuss the costs of pursuing that ideal. And that’s all we do. That’s the only thing we do,” said Stice. The theory behind the program is rooted in a core psychological principle known as cognitive dissonance — the idea that humans have a powerful need for consistency between their thoughts and their actions. Critiquing the thin ideal makes its pursuit seem a lot less desirable. The Body Project is a cohesive program developed by psychologists, but Stice says recent trials suggest it’s an intervention that can be delivered by anybody. Versions of the program led by fellow college students, rather than an older facilitator, were just as effective. While I was talking to Cassin, she noted that many people who have gone through an ED are surprised at what happens when they start to open up about it to others. “Usually the response is, ‘Oh my gosh, I had no idea’ and, ‘I’ve been going through the exact same thing,’” she said. Disordered eating is more common than you think — if you haven’t gone through it yourself, there is almost certainly someone close to you who has. This means it’s on us to do something about it. The first step? Let’s change the way we talk about weight. If you or someone you care about has been struggling with an eating disorder, information and resources can be found on http://www.nedic.ca or https://sheenasplace.org/.